Even though I have been blogging for almost half a year, I can still be amazed by the experience of other people reading my posts, reblogging them, commenting and retweeting them and contacting me directly to express their thoughts. I must admit that it gives me a kick every time. It is not a snow avalanche, but it is enough to increase my motivation and very often it is interesting comments that gives rise to further reflections that again feeds new posts. I have had a great discussion by Gmail-chat with a friend from university about the challenges of communicating research and turning research into practice. And about the lack of acknowledgement of communication activities, if it has to do with anything other than the publishing of articles in peer-reviewed journals. Parallel to the Gmail-chat I had live in-person discussion with another friend also from university, who had a present challenge of how to communicate the results from an infectious disease epidemiological study to staff at health clinics. Very inspiring discussion – for both of us! All in all really inspirering. I look forward to more of this and hope that everyone who has inputs, views, reflections etc, that I should integrate into a course on Public Health Science Communication will not hold back. All the best wishes for the new year to everyone and see you in 2012! 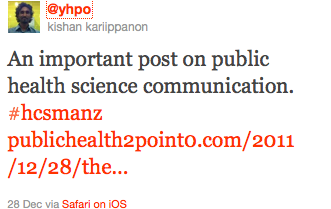 How do you communicate the relevance of science communication to a fellow public health person? 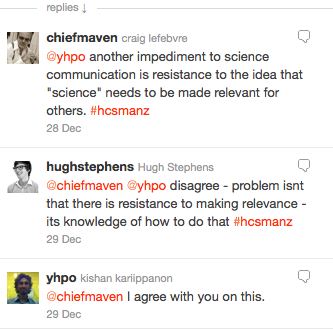 Can I make a convincing argument for why things such as Twitter can be a useful tool in the communication of research? In the days leading up to Christmas, I was challenged by these exact questions, when I after dinner had an interesting discussion with a good friend and skillful researcher in public health sciences. I am not sure that I gave the best arguments for science communication or for why Twitter could be useful for his research, but it made me reflect on where the scepticism, which many researcher have towards communication of research, comes from. Based on my own experience, both as a public health expert and in talking with friends and public health colleagues, it is my feeling that most of us, through our university studies have indirectly been taught that communication is something that comes at the end of a research project. It is to a large extend perceived as a separate element that is added as the final phase of a very often long process. It sort of becomes a sometimes troublesome appendix which can be prioritized – if time and money permits and if the communication department will take much of the responsibility on their shoulders (although they are worried that the communication department will simplify every thing too much and they’d therefore almost rather that they didn’t communicate it at all). Another source to the scepticism against the communication element of research, is that communication is often considered in its more narrow form, meaning that it only covers communication to the general public. It is very much one-way based and it is about making simple messages which, seen from the researcher’s perspective are oversimplifications. My basis for the above is purely my own experiences and conversations with different researchers in various fields. However, it is my impression that I’m not alone in suggesting that the issues above mentioned are two important barriers for researchers enthusiasm for science communication. I have the last couple of days been working on a description for a short course on Public Health Science Communication, which most likely will be offered to students of Public Health Science at University of Copenhagen in the fall semester of 2012. My pre-Christmas conversations have been useful for this work. What was it that didn’t work in my argument? Did we talk past each other? Could awareness of the role of science communication earlier on in our public health training have made a difference? All these questions and more are buzzing around in my head. Communication can be beneficial to the research process. Communication is not equal to dissemination. Communication is two-way based – a with contributions and response from both sender and receiver. The person best equipped to know what is of relevance to communicate and to whom is the researcher him/herself. I’m sure I’ll think of lots of other messages and luckily there is still plenty of time to prepare. All inputs of things to cover in a course on public health science communication are more than welcome, suggestions on good background reading material etc. likewise. Can you do a lecture at university level in 25 tweets? Last week the existence of a virtual university with its address on Twitter came to my knowledge. Svenska Twitteruniversitetet or The Swedish Twitter University as it is also named. The idea of a Twitter university was born in the mind of Marcus Nilsson (@ozonist) sort of in a random moment (read more about it here). The concept is pretty simple. An invited speaker, that be a scientist, an academic etc. gives a lecture divided into 25 tweets (each of a maximum length on 140 characters). Each tweet must be broken naturally and thus be able to stand alone. Using the built-in Twitter limitation such as the length of a tweet is meant to stimulate creativity and challenge the tweeters to formulate their ideas as effectively and interestingly as possible. In addition to the 25 tweets, the speaker responds to questions from the followers – at least for one hour – with their responses not counting to the 25 tweets. This week, on 13th December, a lecture on “How Apps, Smartphones, and Tablets Will Revolutionize Healthcare” was given by Jim Walker, Director Emerging Trends – Cadient Group and founder of AnywhereHealth.com. The lecture was the seventh from the Twitter university and the first to take up a health related topic. Unfortunately, I wasn’t able to follow the lecture live, but the transcript is available on the Twitter University Website. The transcript includes the 25 tweets and questions and responses from the followers. It is very much divided up into a presentation section (the 25 tweets) and after that an invitation to discuss. As far as I can see, there was not much discussion in this particular lecture, and many of the followers expressed disappointment in the session. I must admit that I tend to agree with the critic. The lecture was mostly a listing of a different apps (some of them definitely very cool) that are related to health care and health monitoring. There were some, but very few, reflections on how these apps will revolutionize health care and how it will play together with the exiting health care system, but no reference to experiences, literature or the like that could document this. A few weaknesses of health apps, such as new equity problems due to differences in access to smartphones and lack of IT skills and the risk of technology leading patients to forget listening to their own bodies, where brought up, but again without documentation or much more reflection. I am not certain whether the problem with the lecture was due to this specific presentation or just an illustration of the fact that doing a lecture through 25 tweets is a big challenge. My best Twitter comparison is the #hcsm chats (chats/discussions on Health Care and Social Media), which I have actually found more rewarding. The questions and debate back and forth just seem to take better advantage of the Twitter model. Transporting a traditional (monologue) lecture to Twitter definitely requires a much more interactively thought out structure to the 25 tweets. This Twitter university is still new however, and I find it a fun idea that could perhaps be useful. I look forward to following it and to see if the lectures will develop as the invited speakers become more acquainted with the media. Netdoctor.co.uk, Netdoktor.dk, Netdoktor.de. The “online doctor” websites come in several different languages and are open to all. A social network called DoctorsOnly.dk is a different version of a forum for discussing medical issues and seeking expert help. As reads it is however only open to doctors. At netdoktor.dk people can read static pages on lots of different medical conditions. They can test themselves (calculate their Body Mass Index, find out if they are depressed etc. ), join discussions and share problems and experiences with other users in a debate forum. Entering into an online and publicly open dialogue with doctors is however not an option. There is a “question-answer” function (advice column style), where the doctor answers letters from the users, but this is as far as I can see the only interaction between doctor and user. Also, you never see interaction between doctors. The fact that doctors do not debate openly on a site like netdoktor.dk is probably a good thing. Displaying their disagreement and sometime the lack of knowledge we still have of many medical conditions, would only cause worries with the patients. But doctors do have disagreements and a need to consult with each other. Apparently just not in the open. In addition, DoctorsOnly offers tools for staying in contact with former colleagues and finding experts as needed. It is possible to create smaller circles within the network – eg. a small research group, an ‘alumni’ for an old classmates or colleagues. These networks can be open to all members on DoctorsOnly or exclusive to selected people. A reason to mention netdoktor.dk in relation DoctorsOnly is that they have established a collaboration, where users of DoctorsOnly can help the readers of Netdoktor get answers to the medically founded questions, which can sometimes be difficult to assign to a diagnosis. But given a closed space the doctors can discuss freely with each other before passing on their conclusion to the patient, says community manager at DoctorsOnly, Morten Svenning Nielsen. At a time where social media plays a stronger and stronger role and lots of discussions takes place online, I find it interesting that this trend also provokes needs for closed forums and smaller circles were you can discuss. In many ways it is a very natural reaction, but yet interesting to see how more openness creates needs for more closedness at the same time. I guess Google+ and its structure of circles is symptom of a similar trend. We don’t need to share everything with everyone. Almost everything on DoctorsOnly.dk is login and password protected. It is however possible to get a peak into what goes on in the closed network, via DoctorsOnly’s open Facebook and LinkedIn pages and on Twitter, where debate questions and medical challenges for doctors are presented. It is however only a teaser since you need login and password to DoctorsOnly.dk to read the actually discussion. The inspiration for DoctorsOnly.dk comes from the British doctors.net.uk which is the largest professional network for doctors in the UK, established 12 year ago. It is available to registered doctors in primary and secondary care and is a secure service offering a professional e-mail facility, clinical and non-clinical forums, the very latest medical news and free accredited education.